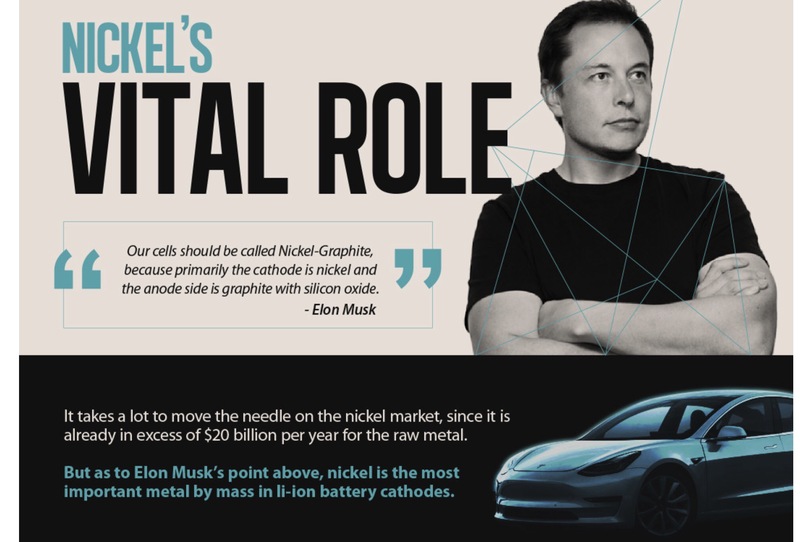 HOMEPAGE >> BLOG >> Nickel - The "Metal That Brought You Cheap Flights" Now "Secret Driver of the Battery Revolution"
Another week, another great infographic by Visual Capitalist – this time on the “Secret Driver of the Battery Revolution” – Nickel. Long an important base metal because of its alloying capabilities, Nickel’s status as a Gateway Metal, yielding access to tech minerals like Cobalt, Palladium, Rhodium and Scandium – all of which are increasingly becoming indispensable components of 21st Century technology – has continued to elevate the metal’s importance. However, as the infographic outlines, it is its application in battery technology that may completely change Nickel’s status going forward. Here, so far, Cobalt and Lithium have been in the spotlight leaving Nickel largely underrated – even though by mass, Nickel already represents the most important component of Lithium-Ion cathodes. In order to increase energy density while reducing raw material costs, analysts expect the overall Nickel content in future battery chemistries to increase even further. Meanwhile, as the infographic shows, most Nickel is not high-grade enough for battery production, with less than 10 percent coming in sulfide form, of which not all is battery-grade material. Since then, our import reliance has dropped even further to 25 percent. If demand projections materialize as outlined in the infographic, that is a good thing, though current investments into the Nickel market may not suffice to fully meet demand. Time for our policy makers and other stakeholders to add Nickel to their watch list and get serious about devising a comprehensive mineral resource strategy.